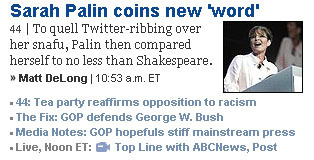 In fairness to the Post, Palin’s miscue was a huge Twitter sensation among lefties last night. I swear, I think about 50% of the posts in my Twitter feed for a two or three hour period last night were lame jokes about “refudiate.” And in further fairness, as long as Palin seemingly has make-or-break endorsement power in Republican campaigns and remains a possible presidential candidate, they have to cover her. But isn’t it about time to limit that coverage to actual newsworthy events? If she gives a major speech on the future of national security in a multipolar world, fine. Cover away. But a mistake in a Twitter post? Maybe think twice about that.